This entry was posted on December 9, 2014 by Jessica Anderson. With the holidays in full swing, It's time to get shopping! Looking for a unique gift for someone special on your list? Even though we sell many awards, we also offer many personalized gifts for both individuals and organizations. Browse our gifts category to see our large selection; all include engraving in the price. Check out the Engraved Flask set - a perfect gift for Santa! 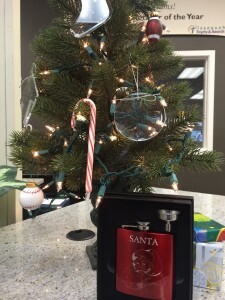 Also, our crystal ornaments adorn our showroom tree. 1. NEW! Engraved Flasks - We are now offering engraved flasks individually and in sets. Colors include brushed silver aluminum; glossy red and blue; matte black, red, blue, green and pink; and leatherette. These engraved flasks make great wedding party gifts, bachelor or bachelorette party favors, and groomsmen gifts. They also make fun team building corporate gifts. 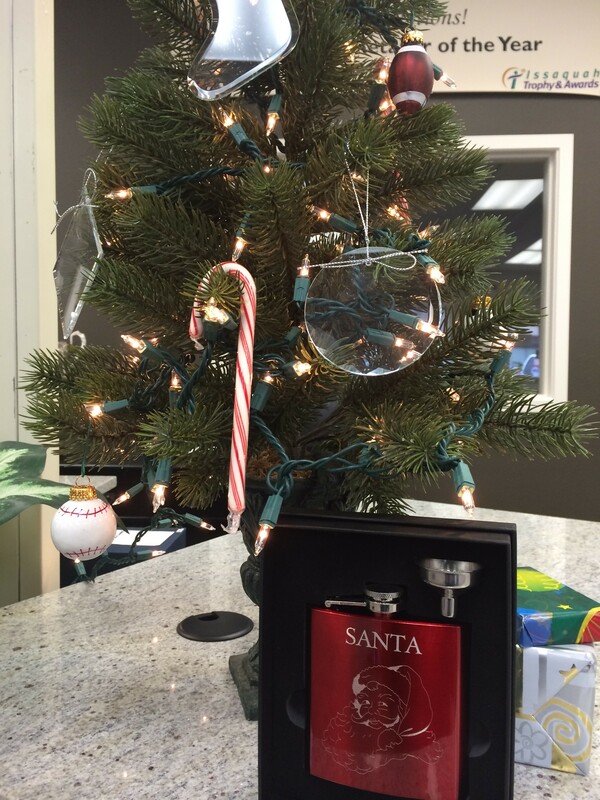 Check out our cute Santa flask to the right! 2. Etched Wine Boxes and Wine Gifts - Forget the wine bag...present an excellent bottle of wine in a beautiful box with your corporate logo and personalized message. Our newest boxes are the Burl Wood Wine Box with Tools and Rosewood Wine Box with Clear Acrylic Lid. Give either to your favorite wine connoisseur with a special message...an engraved wine box will look fantastic displayed in a wine cellar! Check out all of our engraved wine gifts here. 3. NEW! Personalized Bottle Opener - This is the coolest way to take a cap off a beer that I have ever seen. Just press this gizmo over the top of the bottle and the opener pops off the cap! These make great gifts for a guy who has it all. Engrave a name on the side to personalize it. 4. Engraved Crystal Ornaments - Made of optical crystal, our engraved ornaments are a treasured keepsake. Available in a variety of shapes, each ornament includes precision etching in the price. These ornaments are a great choice for remembering a Baby's First Christmas. 5. Engraved Cutting Boards - Looking for a gift that is both functional and personalized? Engraved Cutting Boards are a great option for employees that have it all. This gift will be used daily and can be easily engraved with a company logo. The price is affordable too! Package an engraved cutting board with an edible gift or grocery store gift card for a useful and thoughtful gift perfect for everyone on your list! Personalized gifts are a wonderful way to show someone you care. Browse our large selection now! With our easy ordering process and fast production times, get your shopping done hassle free!